A Cup of the Outback and Travelling without baggage…. More and more as time goes by coincidence, serendipity and synchronicity appear in all manner of creative ways. Today Marcy from Maui invited people to click on to a direct broadcast of the Dalai Lama on Maui. What a thrill and a gift!! I was able to enjoy a full two hours of traditional music and welcome and a divine discourse from the Master of Compassion himself.. The wind spirits were dancing all around the stage …and in my back garden…and it was wonderful to be able to be there in cyber-form as the event was happening. I KNOW this is the power of Desire, of ASKING and Allowing! Uluru!! sitting right there in the centre of the mug looking just like a coffee painting…the mug mirroring the images I had been talking about a half an hour before. The white ‘sky’ space around the coffee-grain Uluru is very similar to the shape of Australia. One of our discussions in the Dalai Lama thread had been in response to the comment his Holiness made regarding the importance of traditional Indigenous Cultures retaining Identity. 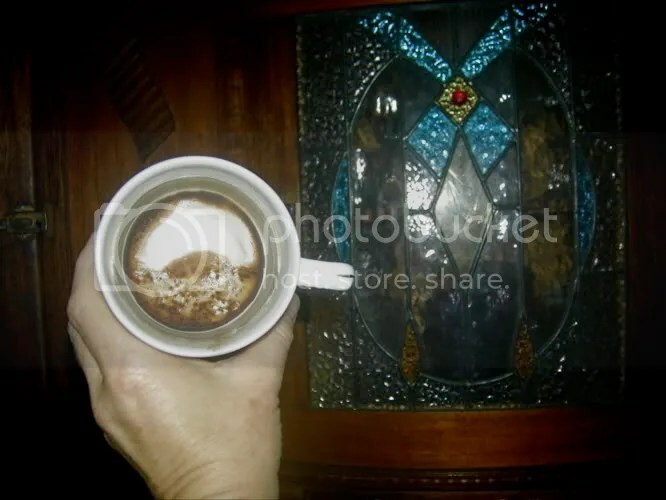 Here in Oz, the image of Uluru is a powerful symbol of the Dreamtime, traditional Aboriginal land and ancient culture so I was tickled-Ochre to see how my observation of the coffee cup and responding with great feeling to the Indigenous culture commentary morphed into one gorgeous Mirrorcle yet again!! But wait! There is more….. There was also discussion and appreciation made over how, through the internet, we can be somewhere as it is happening and feel the vibrations as clearly as if we were there physically. So I guess it is not surprising that the latest radio program pod cast of “Bush Telegraph”, which I downloaded at random onto my I-pod for a post-Maui walk, was about 3,000 rural women from across the globe who are meeting in Africa for a world conference and how some of the Australian women who are not able to be there in person are attending via a sophisticated video-broadcast system that enables them to be seen and heard, to participate in planning sessions, deliver papers and network from their own homes in another country. Having just returned from Maui and my front row seat with the Dalai Lama I was just SO right there with the woman from rural Victoria who was talking about their appreciation of the technology that is so state of the art it automatically swtiches between videos to who ever was talking or answering a question. Coffee cups and sacred rocks, Cyber-conferencing and workshops…sigh….what an amazing time to be alive! *You can see an image of Uluru in my blog here: ….What do The Secret and Uluru have in common? This entry was posted on April 25, 2007 at 10.34	and is filed under Aboriginal, Australia, Community, Creativity, Energy, Imagination, law of attraction, Lifes Stories, Magic, Oneness, Peace, Social Artistry, Transformation. You can follow any responses to this entry through the RSS 2.0 feed. You can leave a response, or trackback from your own site. What a valid post. I enjoy reading the posts on this site and will be sure to return on a regular basis.